I must admit that my heart sank after reading the first page of Chapter Zero, where Bellos describes an Amazonian tribe only capable of counting to 5 (didn't I once read another book that started like this? See George Gamow's One, two, three – infinity). However my initial scepticism was fairly swiftly beaten down: the chapter is included not as a gimmick, but because it is the research topic of one of Bellos' interview subjects, and the chapter grows into a discussion on our perception of numbers and quantities. 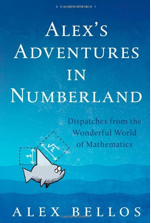 After the "pre-mathematics" of Chapter Zero, there are eleven chapters touching on a selection of topics, chosen not to present a wide spectrum, but to provide glimpses into numberland and (perhaps more importantly) how it can be related to everyday life. There is a lot in the first four or five chapters on number systems, counting and methods for basic arithmetic, while the later chapters tackle slightly more advanced material such as probability and countability. However, the mathematics never gets very complicated – the nearest we ever get to formal mathematics has been consigned to the appendices. This is no bad thing: Bellos isn't trying to teach mathematics, but "to communicate the excitement and wonder of mathematical discovery", and in this he does an excellent job. Bellos' own enthusiasm for mathematics is clear throughout, for example in chapter ten he ritually buys and weighs baguettes for 100 days solely to introduce the normal distribution. The main protagonists of the book, besides the mathematics, are the people Bellos meets. Basing the book on interviews is a fine idea – it transforms the book into a travelogue which seems to suit the popular mathematics genre very well. However, I take slight issue with one of Bellos' stated aims, "to show that mathematicians are funny". I don't think this is really necessary and in any case I don't believe it. As it turns out, most of the eccentric people he meets are not professional mathematicians anyway, but "numerically obsessed lay-people" seeking magic or mysticism in numbers, or the golden ratio in everyday objects, or who are Zen masters of business card origami. Incidentally, I was surprised to learn that business card origami "is a winning way [...] to hand over your business card during mathematics conferences." Still, the interviews are entertaining and complement the mathematics very well. Moreover, the people he meets are passionate about mathematics, and Bellos does an excellent job of describing this passion in a way that is accessible to a general audience. Coupled with the numerous interesting facts and slices of history that appear throughout the book, this is a worthy addition to the popular science bookshelf. Robert Brignall is a lecturer in mathematics at The Open University. His research interests lie in combinatorics.